A small growing tree, Magnolia ‘Royal Purple’ is an excellent choice for smaller gardens. 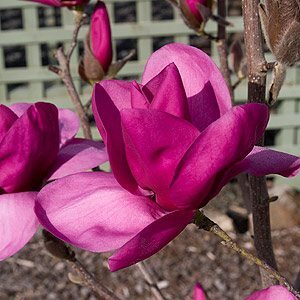 Attractive cup shaped rosy purple flowers on a deciduous magnolia that has an upright habit, make it a useful tree for confined spaces as well as for growing in containers. The flowers open first as a nice cup shape and then to big blousey flamboyant show offs, Deeper pink on the outside and a paler color on the inside. This is a Magnolia x soulangiana cultivar with good glossy green foliage. Grown at the back of the border where it will act as a backdrop for other plants. As a feature tree in a lawn or in the open garden, or as a container or pot grown specimen in a courtyard, Royal Purple is a versatile plant. Best is a humus rich moist soil in full sun to light afternoon shade. Magnolia ‘Royal Purple’ will reach around 4 – 6 m over time with a spread od around 2m after 8 – 10 years. Although reasonably drought tolerant it is best to provide extra moisture during hot dry summers. New plants should be staked to help maintain an upright habit, watered in well with aliquot seaweed fertilizer to promote new root growth and mulched to provide a cool root run. Look for a soil ph of 6 – 6.5.